Four years after resigning at the height of a phone-hacking scandal, James Murdoch is back as chairman of Sky. Second seasons often can be disappointing, but Murdoch’s comeback may be good for the UK satellite broadcaster. Sky’s board doesn’t appear to have made an exhaustive search to replace Nicholas Ferguson. The move might rattle investors, particularly since Sky seemed to distance itself from the Murdoch clan in the wake of the phone-hacking scandal at the now-closed News of the World. But it’s a far different situation than in 2003, when James overcame loud cries of nepotism as he became Sky’s chief executive at the age of 30. In the years that followed, including a first stint as chairman, he managed to win over investors. This time his 11-strong board will have six independent directors, with Martin Gilbert of Aberdeen Asset Management moving up to be deputy chairman. Murdoch, who was already a director, leaves an empty seat that should arguably be filled by an outsider. Murdoch’s appointment probably doesn’t signal a shift in Sky’s strategy. The company had its strongest customer growth in 10 years in the UK and Ireland in the three months ended Dec. 31. The big question is whether 39 percent shareholder Twenty-First Century Fox might make another bid for Sky after its predecessor, News Corp, made and then dropped a takeover approach in 2011. Murdoch, who is also chief executive of Fox, has in the past said owning the minority of an unconsolidated asset “is not an end state that is natural for us”. Yet if that’s the goal, Murdoch’s appointment would only complicate things. It makes little sense to fuel speculation that could make Sky’s shares, up more than 2 percent in morning trading on Jan. 29, more expensive. Conversely, it probably signals that Fox isn’t planning on selling soon, either. And that Murdoch’s rehabilitation from the phone-hacking scandal is largely complete. 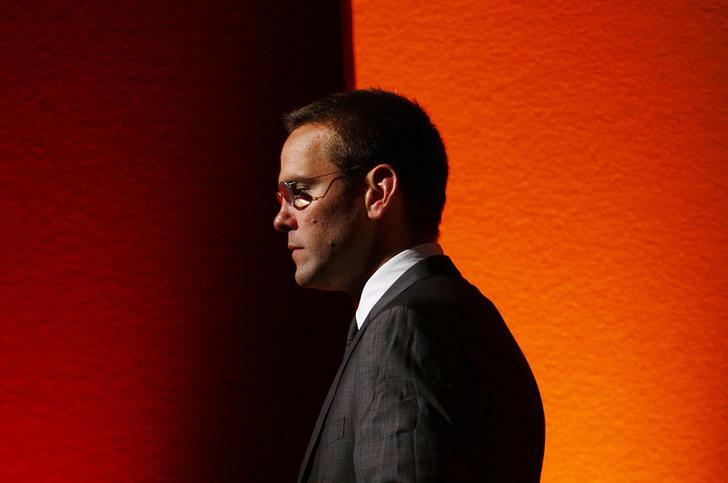 James Murdoch will become chairman of Sky after Nick Ferguson stepped down, the pay-TV group said on Jan. 29. Murdoch resigned as chairman of Sky in 2012 after a phone-hacking scandal at News of the World. Murdoch is chief executive of 21st Century Fox, which owns 39 percent of Sky. News Corp, Fox’s predecessor, abandoned a bid for the 61 percent of Sky it didn’t own in 2011 in the wake of a phone-hacking scandal. “James’ deep knowledge of the international media industry and his passion for supporting Sky’s ongoing success will make an even greater contribution to our business in the future,” Chief Executive Jeremy Darroch said on Jan. 29. The appointment came as Sky reported a better-than-expected 12 percent rise in operating profit for the six months to Dec. 31, against the same period a year earlier. The pay-TV group said 337,000 new customers joined Sky in the second quarter – the highest UK and Ireland customer growth for 10 years. At 0934 GMT, Sky shares were up 2.5 percent to 1,067 pence.